After a long silence, it’s a new year and a new post. It’s been a hell of a temptation to have some fantastic whiskeys on my shelf waiting to be tasted and blogged about for about four months. I’ve made it through the rigors of my first semester of grad school though, and can now happily reward my patience with a glass of WhipperSnapper. I picked this bottle up back in August when I first moved up to Cambridge from Brooklyn, but I read about it few months later when the Huffington Post got down to reviewing it before I was able to lift my head out of the books. From that review and all the others I’ve come across over these long months, WhipperSnapper seems to have some savvy buzz-makers behind it in its creator — Ransom — which also recently released an Old Tom-style gin in collaboration with the esteemed cocktail revivalist, David Wondrich. From what I’ve been able to gather, they source the corn spirit, which makes up 79% of the unaged mixture, from other distilleries and re-distill it, while making the 21% barley spirit themselves. This is an interesting combination approach (compared to products like High West which outsource distillation entirely) that probably helps them decrease production time and keep volume up. 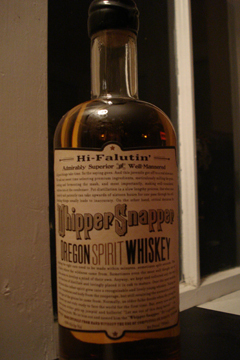 Additionally, it seems that one of the main selling points is that WhipperSnapper is aged partially in French oak barrels previously used for pinot noir-based wines. I’ve only had one other whiskey aged in ex-wine casks (one of the Buffalo Trace experimental releases) and I quite enjoyed it, so I’m looking forward to seeing how this is expressed. Now, on to the important stuff. In general, I’m not a fan of using too much text on a whiskey bottle. The copywriters for such things tend to get worked up in nostalgic histories of grandfathers and secret family recipes and the like. While this may add some weight to the drinker’s sense of what American whiskey should be, it usually comes across as disingenuous marketing drivel. WhipperSnapper uses a lot of text on its faux-mid-19th-century label. Aesthetically, this is pleasing, the small type of the lengthy mini-essay on the front label contrasts well with the bold type and curved outlines of the central text. The content however just comes across as self-aware marketing drivel — best not to read too closely and just enjoy the otherwise well-designed label. I say well-designed even though they push close to tourist-trap levels of Old Westiness by putting the phrase “High Falutin'” at the very top. I understand wanting recall a golden age of American spirit production, and I don’t want to gripe too much about a genuinely attractive label, but some times these things go to far. Two things come across instantly on the nose: first is a prominent corn scent from that 79% white dog, second is a burst of juicy sourness that I bet hails from those pinot noir barrels. It reminds me of a beer that’s been aged in wine casks, definitely unexpected in a whiskey, but nonetheless intriguing. Behind this, you can pick up some of that barley influence as well. Combined, it’s something like a sour cherry crumble Definitely a whipper-snapper though — this whiskey is young if the nose is any indication. It changes tack on tasting it though. The sourness becomes a secondary characteristic to an appealingly sweet frosting/birthday-cake sort of sensation. The back of the tongue picks up the corn and (less so than I’d expected) the barley, but the focus here is on the creamy sweetness more toward the front. The sour wine-like qualities come in after this first wave dies down, but only slightly, and far from over powering. The finish is warm but not particularly notable, probably owing to its relative youth. Nice work, Ransom. I’m curious to see what this would be like with even more of the wine cask influence, but what we have here is quite good. It is smooth beyond what its nose seems to imply and that buttercream opening is very appealing. I’ll be drinking this again soon.